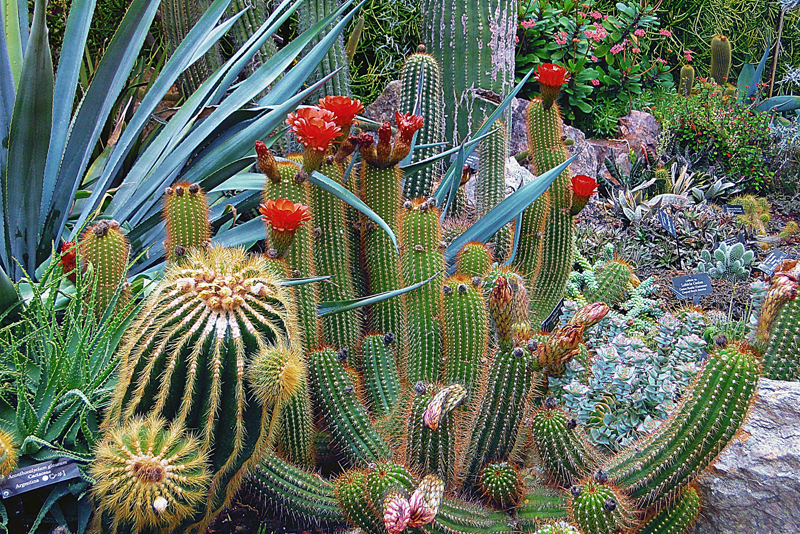 Novice cacti and succulent gardeners will do well to begin with easy to grow species. These tend to be readily available, and actually are among the most popular houseplants. For beginners, here’s a great book on indoor gardening that will help them succeed with their first cacti and succulents. “The Complete Guide to Houseplants-the Easy Way to Choose and Grow Happy Healthy Houseplants” by Valerie Bradley was published by Reader’s Digest. This is a lushly, full color illustrated guide with over 300 photos and 250 of the most commonly grown plants. Of those, 30 or so are cacti and succulents. Among these are several that provide seasonal color indoors, such as the Easter cactus that blooms during the spring as well as the Thanksgiving and Christmas cactus during the fall and early winter. Other species in this volume that are best known for their beautiful flowers include cereus, kalanchoe, hoya, and the moss rose as well as the orchid cactus. The bushy or tree-like succulents and cacti in this title include yucca, jade plant, and the ponytail palm along with pachycereus—an upright columnar cactus. In addition, a number of other commonly grown succulents are profiled here as well, including the burro’s tail, the snake plant, and living stones. The other cacti and succulents include red crown cactus, parodia, rose pin cushion, several species of prickly pears, barrel cactus, and echeverias. There are a number of bromeliads as well though every gardener doesn’t regard these as true succulents. This invaluable guide provides complete details on how to grow each of these plants. For each one, there is an in-depth description along with information on how to grow and care for it properly, its method of propagation, preferred growing conditions, and its mature size. There are symbols giving the preferred light, and temperature in Centigrade and Fahrenheit. The author includes a section on each aspect of plant care from routine things to repotting, coping with insects and diseases, to displaying houseplants within the home, and choosing a container. In the introduction, she provides everything you’ll need to know in order to select appropriate species and how to choose a healthy houseplant when you’re shopping in garden centers. There are also handy tables listing suitable plants. The appendix has a helpful glossary.